Life is beautiful, no matter the ups and downs at the end of the day life is meant to be lived beautifully and Suave is reminding us to do just that; "Live Beautifully". Living beautifully and purposely is essential to our busy lives. It's a way of staying sane in this crazy world. If we live happily and cheerful than life is much more beautiful. Less stress, less wrinkles, less tension equals good health and a long happy life. I grew up shopping at H-E-B, and Suave was and is a brand that is usually in my shower. Not only does Suave come in a variety of scents it performs just as well as a premium brand for a whole lot less and that my friend, makes me smile. My husband is the Suave purchaser and I'm the user. lol I use the conditioner, my hair is thick and find that the Suave conditioner helps detangle my hair and leaves it soft, manageable and beautiful. That's one way I spoil myself. I also use the Suave Kids Purely Fun 3 in 1 Shampoo, Conditioner & Body Wash on my son, Anthony. Of course, I use the conditioner as well for his hard to handle curls. My mom, the Suave queen introduced me to the brand as a child, matter of fact she still buys it. She loves it. She prefers the Suave Coconut Shampoo and Conditioner, she says it makes her feel as if she's in Miami. I love that woman! If you want to learn more about Suave and share how you and your family live beautifully click here. 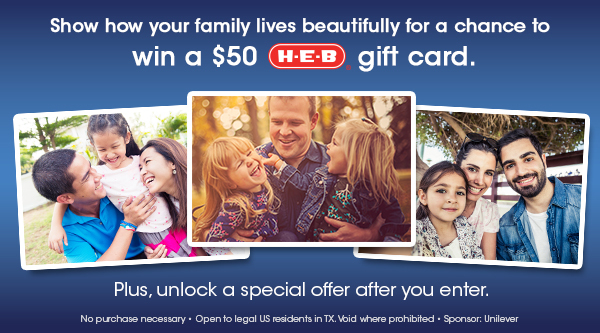 Enter to win to a $50 H-E-B Gift Card by submitting a photo entry which is worth 25 entries and submitting your info is worth 1. Once you are entered, you will have the opportunity to unlock a special offer on Suave Men and Kids products.